Some users will be using the iPad/iPhone to enter in data for athletes where they can only partially complete an entry and then they have to enter in a new record or update information for another athlete. Any records saved on the system appear on the My Schedule Page. Use the My Schedule to go to the date these entries were entered on. When you can see the entry, Click on it to open the record and resume enter data into it. 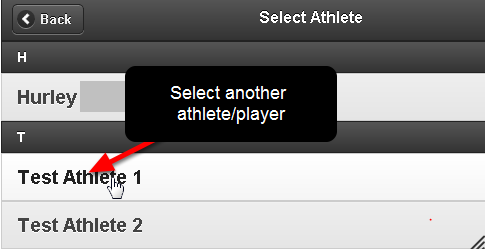 The steps below outline how to enter in a new entry for two athletes/players and then to update these entries from the My Schedule Page. When you first load up the My Schedule page it may be blank because no events have been entered for today's date. The example here shows that a number of records have been entered for today's date. Any of theses records can be opened and edited by clicking on the entry. N.B. If you want to update an existing record, then skip these steps and go directly to the My schedule page now. Some users need to be able to partially complete a new record and then create a new record for another player. This situation occurs when a player is being scouted, or when a coach is undertaking fitness testing for multiple athletes and more than one test is being tracked in an Event Form. For this work flow a scout/coach would enter in a new entry, complete some of the record and click on Save and Enter Another to enter in a new record for another player. 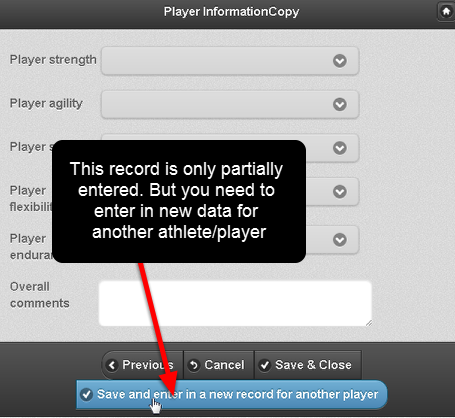 If the coach/scout needed to enter in new data for more than one player, he/she could click on save and enter another again to create another new entry for different athlete/player. 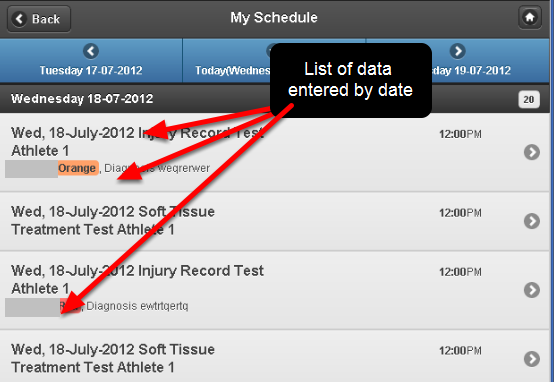 The most important consideration is that when you have created the new records and you want to update them, this is done by opening them from the My Schedule page (or the Athlete History page depending on the available modules). Remember that each time you click on save and enter another, you will create a new record, not open an existing record. 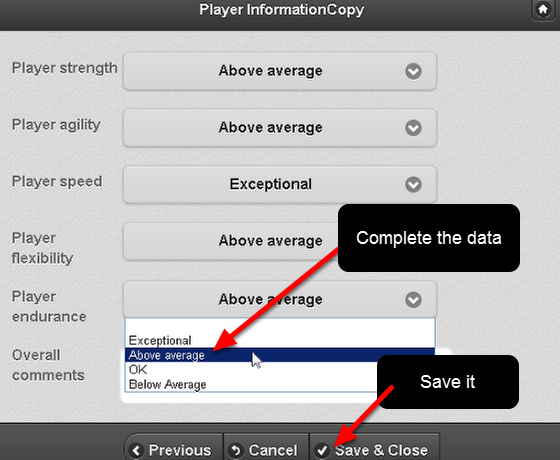 Select the next player you want to create a new record for after you have selected the "Save and Enter another" button. 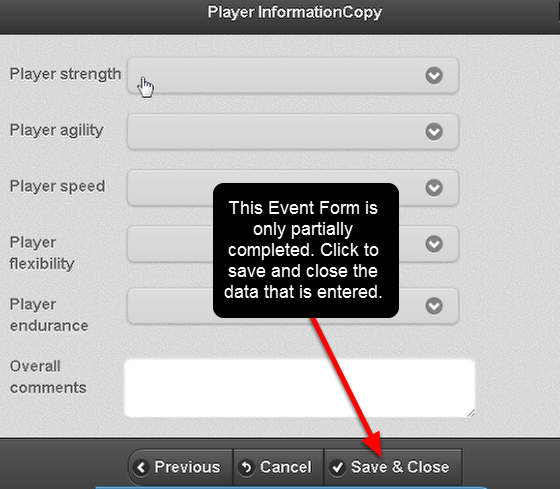 After you click on the record you can complete/update the information and then "Save and Close" or "Save and Lock" (if you have completed the entry and locking capability is set on the Event Form). Remember, once a record is created on the system it will appear under the correct date in the My Schedule Page. 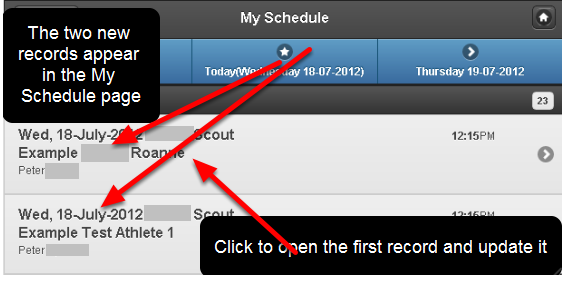 You can open your existing record from the My Schedule Page and update it. Any problems or issues then ask your distributor.